Baseline Engineering designed the $3.2 Million Integrated Fixed Film Activated Sludge Wastewater Treatment Facility for the Town of Red Cliff. 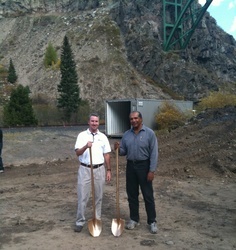 Ground Breaking for the new plant occurred on September 29, 2009. Finally! 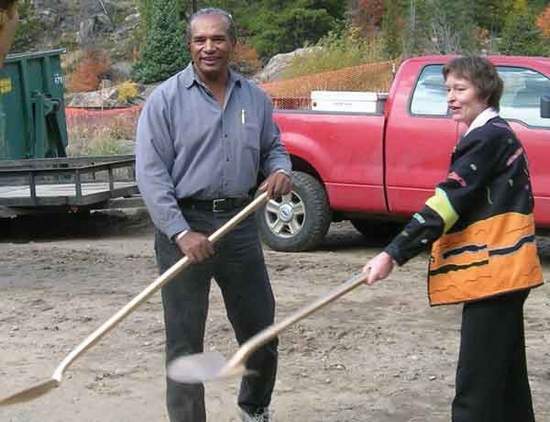 That was the collective feeling of the project team on September 29 when ground was broken on the new Red Cliff Wastewater Treatment Facility. A project that has been 20 years in the making took a major step forward and is now under construction. Even a decree from then Governor Roy Romer in 1995 couldn't get this project under construction until now. The Town of Red Cliff, Colorado, population 350, is getting a new wastewater treatment facility. The project is being paid for with $2.0 million from the American Recovery and Reinvestment Act. The remainder is being covered by a block grant from the Colorado Department of Local Affairs. In attendance at ground breaking was the Executive Director of the Colorado Department of Local Affairs, Susan Kirkpatrick. "This project is one of only three in the state of Colorado funded in part with American Reinvestment and Recovery Act dollars for infrastructure," said Kirkpatrick. "The timing had to be just right to make this work. We had to be 'dirt-ready' when the stimulus dollars became available, and then we had to jump through all the hoops to make sure all the engineering was completed and approved," said Red Cliff Mayor Ramon Montoya. "Funding has been very difficult, and this project almost failed several times." John McLain, Senior Project Manager and a Principal at Baseline Engineering in Golden, Colorado said, "It was about five years ago that we were engaged to fix what we all saw as a major environmental issue." At that time, Red Cliff was number one on the EPA's wastewater discharge violators list and out of compliance with regulations. The plant discharges into the Eagle River upstream of several other towns and is tributary to the Colorado River. The road to construction occurred in baby steps since 2004 as Baseline undertook Master Planning, Site Application, Environmental Assessment and Preliminary Design in a stop and start fashion as the various funding agencies pulled the project in different directions. "It was a tough road, but that is what we are here for," said McLain. "The last few months leading up to September 29th were very intense. If the project wasn't executed perfectly, approved and shovel ready, we would have lost the funding and been back at square one. I understand now why only 3 projects in Colorado were funded by ARRA - it was very difficult to meet the requirements and the deadlines." The plant is expected to be up and running by August of 2010. "This project required strenuous collaboration among local, state and federal governments to leverage expertise and dollars to solve problems. DOLA's mission is to strengthen Colorado communities and we only accomplish our objectives through partnerships with leaders like Baseline," said Kirkpatrick in a letter to Governor Ritter. Mayor Montoya said, "Today, because of the support from several entities, we took a major step toward the protection of the future of the river, the forest and generations to come." What was once the poster child of a rural water system in trouble, as the Denver Post used to report, will now be the shining example of how to get infrastructure replacement projects accomplished.